3D printing businesses offer 3D design and printing jobs at very affordable prices. Most are accessible on the web so you can easily compare their portfolio and prices and see who among them offer a high quality 3D printing service. “Where can I get something 3D printed?” “Where to get 3D printing done?” Have you found yourself asking these questions? If you do, then this page is for you. 3D printing technology is growing in popularity and more and more are finding themselves needing this, but they don’t know where to go to. In this page, you will learn about commercial 3D printing services that offer different types of 3D printing jobs such as rapid prototyping, laser cutting, 3D designs, and more. Most importantly, I will share a list of 3D printing sites that offer and deliver this service. If you want to 3D print an object, but you don’t have a 3D printer or you’re too busy to look for the nearest shop near you, don’t worry. There are many companies online who can help you get the job done. 1 What Do 3D Printing Businesses Offer? 2 Who Needs This Service? 3 How much do these services cost? Depends on size and material. Depends on material, machine space, and number of parts (labor). Depends on the size (e.g. teacup is $5-10). Depends on type and amount of material, density and resolution. Before I discuss give you the list of the 3D printing companies who offer the best services online, I’ll give you an overview what this industry has to offer. What Do 3D Printing Businesses Offer? 3D printing companies offer 3D printing jobs like 3D design and printing. This is very useful for prototyping or bringing to life your ideas in reality. This technology is practical and is also applicable to aerospace, medicine and education. For this reason, 3D printing manufacturers and companies have become in demand. In the fact, they are experiencing a rapid growth and this is expected to continue in the coming years. Even individuals who own a 3D printing machine and is knowledgeable of the craft offer this to those who need it. This type of services is very accessible. There is a lot of 3D printing online shop and you can easily find them when you browse and check the internet. 3D printing applies to almost any areas of your life. So getting your own machine will be very helpful. However, if you are not willing to invest for one, then a 3D printing service is perfect for you. Here are more reasons why you should get this service. If you are in business and you need a working prototype for a client presentation, using a 3D printer will make the process easy and fast. Usually, creating one with the traditional process will take time, money and energy. However, the cost, time and labor will be greatly reduced by using this technology. In fact, some of the individuals who use this type of service includes Architects, Engineers, Real Estate Brokers, Interior Designers, and Business owners. 3D printers can be cheap or expensive depending on the brand and model. However, buying one and maintaining it isn’t that easy and practical especially if you do not use it often. These types of machines are not a plug-and-play thing, there are tons of things that you have to consider when you want to get one. Sometimes it might involve training yourself or a staff, setting up a software, maintenance, purchasing materials (filaments, print heads, etc.) and disruption operations. Yes, buying and maintaining this equipment can be costly. It’s not for everyone. Thus, there are businesses that offer this type of service. They make 3D printing affordable and accessible to anyone who needs it. Owning a 3D printer can help you save if you have a business or you have to do three dimensional printing often for some reasons. Yes, owning one will be practical if you know how to use it and make money from it. However, if you don’t and if you rarely need it, then the best option for you is to get a 3D printing company’s service. These services offer you the convenience of producing 3D objects anytime you want without maintenance cost. Customized items are very popular nowadays. In most cases, even gifts like mugs or key chains are now customized by adding the recipient’s name or photo. Custom 3D printing is a real thing. With this you can almost realize anything you have in mind be it a stand for iPad, a bottle opener, a pencil container, a cup, an accessory holder or even a shoe. The benefit of customizing shoes is that it caters to the actual shape and size of your feet, which delivers great comfort. For athletes, this could help them maximize their performance. Companies who 3D print objects from models are not only for those who are completely inexperienced because even experts seek for this type of service from time to time to try or learn new stuff, materials and design. 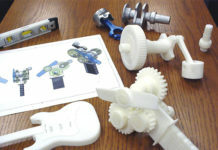 According to Stratasys Directs, a number of 3D printer owners come to them to try new materials that they don’t have or to customize their tool, jigs, and fixture. At some point, you might think that owning a machine will help you save more, but this also depends on how frequent you need it and how much the maintenance cost is. For instance, according to Sculpteo.com, it is more affordable to avail this service from a 3D printing business than buying Makerbot Replicator 2x and Formlabs Form 1 for one or few prints. Sculpteo.com calculates its 3D printing price by considering the printer cost (divided by output over 3-year life) materials, maintenance, labor and electricity. So, for example, a ring measuring 23 x 11.6 x 23mm will cost $8.37 from Sculpteo, $9.34 from Makerbot Replicator 2x, $11.01 from Formlabs Form 1 and $33.10 from Stratasys Mojo. 3D printing service cost depends on several factors. For Shapeways, service cost includes the materials used, machine space and labor. On the other hand, Sculpteo’s pricing considers these three factors: investment cost of the printer, materials and maintenance, and labor and electricity. It can also use this formula: retail price of printer and installation cost over a 3-year timeframe. A small item is cheaper compared to bigger items because it uses less material and reduced labor. However, the complexity of design and the number of parts has nothing to do with the price. If you are looking for this type of service it is important that you check the price well because the cost can differ up to 100%. So, take the time to compare the prices from the different companies who offer this service. You can use 3D Printing Price Check. The site allows you to upload an STL file in mm or in units. If you want an estimate because you don’t have the STL file, you can use the sample files provided which include the details about the volume, surface area and bounding box for the output. The page also allows you to choose different materials for your 3D printing project like ceramics, glass, metals, plaster, plastic and precious metals. At the same time, it allows you to choose from different 3D printing outlets like Shapeways, makexyz.com, Sculpteo and more. You can only find a cheap service after making a few rounds of comparison. The price should not be a great concern though as this technology is deemed low-cost and fast. In addition, more and more companies are starting to offer this service. With tighter competition, the price will surely go down. Most companies now turn to 3D printing markets to create prototypes. Prototypes are very important in businesses. The traditional prototype manufacturing is often time-consuming and more expensive. However, 3D printing makes it fast and low-cost. Due to its promising potential, a number of companies are now offering this type of service offline and online. According to IBISWorld Industry Analyst James Crompton when the economy is fine the manufacturing activity determines the industry revenue. A number of small players have already joined the market. In fact, a number of startup industries like Shapeways and Ponoko have already developed a cost-effective method to manufacture customized 3D printed products which boost the demand for this type of industry services. The report was published two years ago and by that time the consumer market for 3D printing was still in its infancy but Crompton saw its potential for growth. At the time, there are already a number of companies in the US which confirms that the 3D printing industry is indeed booming. In the next section, we will provide you a list of companies who can do the 3D printing job for you. We know that there are tons of 3D printing businesses out there, so choosing the best one might be challenging. So, to spare you from the hassle of research and to help you save time, we create this comprehensive list of 3D printing stores that offer commercial 3D services. This is a 3d printing website that serves as a network of thousands of 3D printers all over the world. This is designed to help everyone, including those without 3D printing machine, get an access to one whenever they need it. So, how does this work? You can upload your 3D design in .stl or .obj format, choose a material for your application and select a from various 3D printers. To help you decide, it will show you the price, speed and quality produced by different individuals or businesses who offer the service. You would then choose who among them will get your 3d models printed. The average work around time is 2 days (48 hours) but 50% of the orders are delivered within 24 hours. 3D Hubs also offers a number of materials to choose from including fiber-reinforced nylon that is as strong as aluminum but as cheap as plastic. On the other hand, rigid opaque plastic for realistic prototype comes with impressive details and high accuracy. The transparent plastic works well for see-through parts and prototypes, full-color sandstone, simulated ABS and Industrial metals to name a few. 3D Printing Ally caters to any industry and 3D print any product in any size. It offers custom 3D printing and has a fast turnaround time of 24 hours. Just like any other 3D printing online shop, they offer an instant quote by uploading your .stl file. If you have a CAD design but can't decide the material that you should use for it, the site has a model uploader feature for this. This 3D printing website uses different technology including Selective Laser Sintering (SLS), Fused deposition modeling (FDM), Stereolithography (SLA), MultiJet Printing (MJP) and ColorJet Printing (CJP). It also offers a number of materials like DuraForm PA, ABS-M30, Polycarbonate, Ultem 9085, VisiJet SL Clear, VisiJet Crystal and Ceramic. I need something 3D printed! If you are this person, then you have to visit this site. This website helps you discover the unimaginable. With its 20 different materials and over 100 possible color combinations, you can turn all your ideas into 3D printed reality. Among the materials, you can choose from are plastics, resin, precious metals, steel, ceramics, woods, titanium, 18K Gold and more. They also offer polishing, dyeing, gold plating and more. The site also includes 3D design and printing tutorials. It helps you get yourself familiar with 3D printing materials and the technology, itself. For those who do not have the inclination to learn 3D designing, the site has a "Hire a 3D Designer" section. The process with i.Materialise is fast and easy. You can order in seconds with instant pricing and automatic file checking. Prices are also affordable. MakeXYZ is a US-based 3D printing business that offers a full menu of 3 printing services. It aims to connect 3D printers and designers in the neighborhood to let one find the best service easily. MakeXYZ offers different technology like FDM, SLA, SLS, and Polyjet. It is very versatile that it also accepts different types of files including stl, obj, zip, step, stp, iges, igs, 3ds and wrl. It also includes a number of materials like ABS, PLA, Nylon, Wood, Paper, Bioindustrial/Medical plastic, full-color sandstone, ceramic, resin, and more. The process is very easy and it offers you different options because you can customize it. For instance, you can have a MakeXYZ print manager to handle the complete process. If you have a 3D file, you can also upload it and the print manager will handle the logistics. You just want to connect to a 3D printer directly, that is possible too. The site includes a "Find 3D Printers" list that includes the printer's name, location and his/her skills. One advantage of this is that working with a 3D printer pro may speed up the process and you might get the 3D object soon, like on the same day. This online 3d printing site is a great marketplace for enthusiasts and professionals because it connects the customers to manufacturers. Yes, Ponoko doesn't do the manufacturing itself but uses a network of manufacturers all over the world. Ponoko has a standard turnaround period of 1 week but it is also possible to ship the item on the same day. Ponoko has 180,000 designers, 550,000 custom products, over 99 beautiful materials and big-time customers like Oracle, Google, Cisco, Disney and Autodesk to name a few. So, if you are still asking this question: where to get things 3d, I suggest that you visit Ponoko. This company uses industrial 3D printing, an additive manufacturing process that works best for rapid prototyping, complex designs, multipart assemblies, and functional end-use parts. It also uses different technology like SL for thermoplastic-like parts and SLS for industrial grade nylon components and direct metal laser sintering (DMLS) for a fully dense metal production. Among the materials it uses are ABS, Die-cast aluminum, Polypropylene, nylon, stainless steel, cobalt chrome and more. Aside from 3D printing, it also offers CNC machining and injection molding. Proto Labs is one of the companies that offer commercial 3D printing services with the fastest turnaround time. They can ship or deliver custom prototypes and low-volume production parts in as fast as one day. In fact, they are the world's fastest on-demand manufacturer for these services. It has global manufacturing facilities in seven countries including in Europe and Japan. This site aims to connect you to 3D designers to give you access to thousands of ideas from designers and businesses. They get things 3D printed. You can browse their collection and customize your 3D model for printing. If you need training resources to learn 3D printing or expand your expertise, the site includes ebooks, webinars, and tutorials. Sculpteo uses different technologies to cater different materials. These are the technologies they use for each material you wish to utilize on your application. Here’s a table of the technology, process, materials used by Sculpteo including the advantage and disadvantages of using it. Just like other companies, Sculpteo is very easy to use. Just upload your file, the website allows over 25 formats for your convenience. They will repair it if there are issues and give you an instant online quote. Then, set up the quantities, optimize your object using their 3D tools and place your order. They will start to 3D print your order immediately. Normal turnaround time is 24 to 72 hours. The company is asking for extra 2 days for dyed plastic. As for silver material, average delivery time is 21 days. "Where to get things 3d printed" in San Diego, CA? SD3D aims to be the one-stop-shop for 3D printing in the city by bringing you a group of aspiring entrepreneurs from different fields of background including engineering, design, business and economics. The company has an automated system that offers one of the most affordable prototyping and manufacturing solutions in the 3D printing market. They also use a Cloud-based network to monitor print status and print objects in batches. SD3D offer a huge variety of materials including PLA, ABS, T-Glase, PET+, Bridge Nylon, and Nylon 680/910 to name a few. The standard turnaround time is 3 to 7 days but they also offer an expedition service with $40 fee depending on the size and quantity of your project. Due to the extensive options that the company offers, you can surely find a service that is within your budget be it for pure rapid prototyping, high-resolution prints with added finish or large volumes. Shapeways is one of the leading companies in the world that offer this service. It is a marketplace where users can design and upload their own files. As these designers easily sell their work, Shapeways process the manufacturing, distribution, customer service and payment. The company offers over 50 materials to 3D print your project including plastics, porcelain, aluminum, porcelain, silver, and sandstone to name a few. Standard turnaround time with Shapeways depends on the material ordered and the shipping option. However, they offer a rush production that delivers within 2 business days. The website has a Customer Service team to help customers deal with late orders, returned items or issues after delivery. Also, if you already have a model and you are wondering where to print 3d models, this 3D printing website offers the same service. You will definitely find Shapeways helpful if you are into 3D printing. Voodoo Manufacturing offers a small-batch manufacturing with high-volume 3D printing. It offers to bridge the gap between prototype and mass productions, which makes it one of the best 3D printing businesses. The process with Voodoo is very easy. First, you will start with your own 3D model or have their professional designers create one for you. You can make one anywhere from 1 to 10,000 parts in as fast as 24 hours. The company offers direct print, volume printing, print API, and 3D design. They have worked with Autodesk, Syfy, Intel, Universal and Microsoft to name a few. So, you can guarantee the quality of their output given that they have already worked with prominent companies. There are tons of companies offering this type of service today, some you can find in your neighborhood while the others are accessible online. The latter is more convenient for those who do not have the luxury of time to explore their area to find one. However, one of the things that you should consider before getting a service is its price. In general, 3D printing can be expensive but some businesses offer affordable pricing to cater everyone’s desire in bringing their design into the real world. The challenge now is to find the most affordable services. I suggest that you compare the prices from different companies to see who offers the most affordable service. You can check this site for industrial-grade 3D printing price comparison. It compares the prices from Shapeways, i.Materialise and Sculpteo. You can also check this other site. It has been used by Trusted providers because they offer transparent pricing. 3D printing companies have different turnaround time. To help you decide which among the popular online 3D printing businesses is the fastest, we have a table for you below that shows the quickest delivery time that each site offers. If you want to own a 3D printed object without getting involved in the design and printing process, you can also check these sites. There are individuals and manufacturers who offer 3d design and printing. You can have them do the entire process and just pay for it. It's just like ordering something. The good thing about this is that you can customize the item to suit your needs or requirements. For instance, if you want 3D printed shoes, they can design it to cater your feet's exact size for maximum comfort. You will surely love it. "Where can I get 3d printing done," "where to get something 3d printed," "where can I have something 3d printed" or "where can I print 3d objects" are questions that are very easy to answer as there are already commercial 3D printing services online. This indusry is fast growing and over the past years, a number of companies, manufacturers, and 3D printer owners are rendering the same service. Thus, already making it more affordable to many. However, they have different turnaround time and prices. You have to do your research to find the one that fits your budget, requirement, and materials. If you need to learn more about 3D printing, feel free to check our homepage. Next articlePLA vs ABS Filament: Plastic Strength, Flexibility Compared! Which Is Better For 3D Printing?